Then there are those of us who tend to overthink things – again, I’m totally guilty here! When you sit down to think about it…. 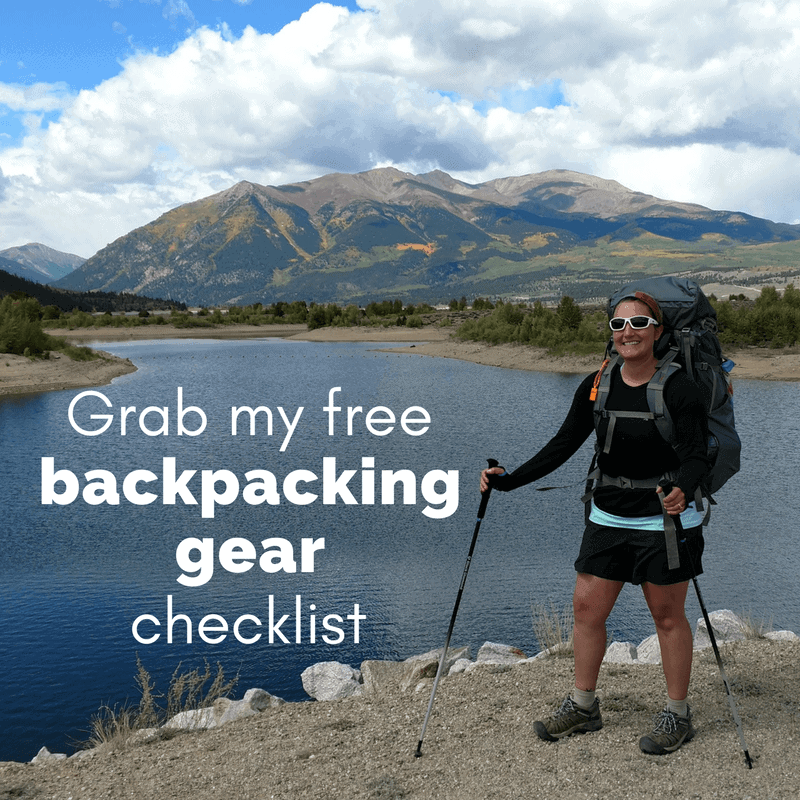 How are you going to fill all the hours of your day on a backpacking trip?? 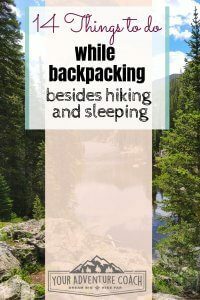 Backpackers are generally split into two camps here, in the one camp, they say if you get bored while backpacking – you aren’t hiking far enough/long enough/hard enough in a day – hike more and then literally all you will want to do when you set up camp is lay down and go to sleep. You won’t have time to get bored. Then there are lazy hikers like me, I use that term affectionately, who do like to take long breaks through out the day and enjoy some ‘down time’ at camp before you go to bed. So, what do we do without Netflix to entertain us? 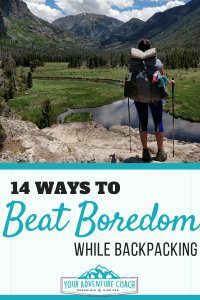 Don’t underestimate the damaging effects of boredom on the trail, it really can ruin your trip if you let it. I find especially if I don’t have a way to preoccupy my mind at night – I get super anxious, scared and paranoid that something bad will happen. Nothing bad has happened yet, so it’s best to keep negative thoughts from popping up in the first place. 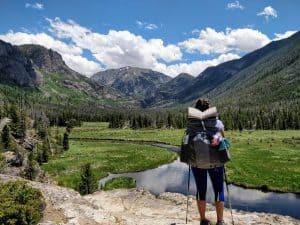 The goal here, and always, is to have a fun, stress free trip that will give you the momentum to keep going out on more hiking trips. 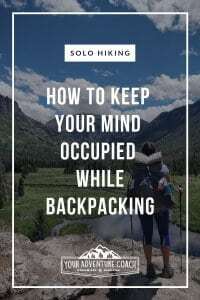 Keep your mind occupied on the trail with the tips below. Bring a book, preferably a lighter weight paperback if you bring a physical book. Load up a book or a few on your kindle app to read on your phone or bring along a kindle. Download plenty of podcasts or audiobooks to your phone to listen to offline. Bring a lightweight journal or notebook and journal away. Print out a sheet or half sheet of journal prompts to bring along if you need some ideas. 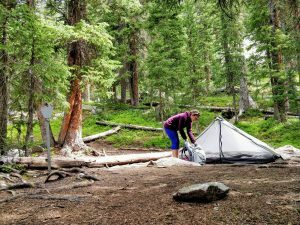 If you’re at a shelter or shared campsite, get to know a little bit about each of the hikers there with you. Take the time to stretch, especially your legs and back, at the end of the day. Meditate, either on your own or download some guided meditations to listen to offline. Bring a small travel book of sudoku or word puzzles. If you took a million photos that day, don’t we all tend to do that now that film is largely a thing of the past? Go through them every night or every couple of nights and delete any that you know you won’t use. Then you won’t even have to bother uploading the bad photos when you get home. Bring a handful of postcards or note cards and write letters to send when you get to town or at the end of your trip. Bring a harmonica or other instrument, if you’re willing to spare the weight of it. Bring a field guide to the local plants/trees/birds/etc and try to identify as much as you can around you. 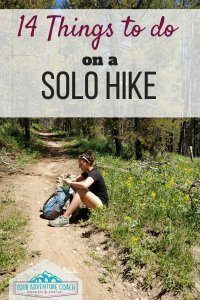 If you’ll be on a more popular trail, it might be worth it to bring a deck of cards or other small/light game to play with other hikers. 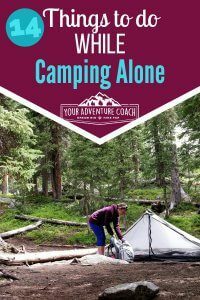 Feel free to share your favorite thing to do while hiking and camping alone in the comments below! If you enjoyed this post – share it out!